"Both health and Sickness have their roots in the colon." "Let no one ever come to you without coming away better and happier." When I first came to see you, I didn't feel I was going to make it as I was so very sick. You not only brought me back to life and health, you taught me self love through your loving care. I will always thank you for this gift." "I first met Michi four years ago when I knew my health and emotional well-being were out of balance. 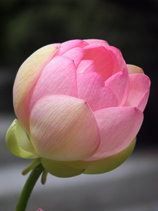 I began a healing journey with her that completely changed my life in so many wonderful ways. — My skin problem cleared. — My emotional and mental attitudes shifted into a clearer, lighter and happier place. Most importantly, Michi educated me about the need for optimum intestinal health. A clean healthy intestine helps me personally and professionally. I can share my optimum health and well-being with everyone in my life. MichiMagic is incredible!!!" You are a miracle worker, and the best therapist ever can be. Thank you for putting me back on the right path of balance. I believe in Ayurveda and colon therapy now. And thank you for teaching me how to stay in balance. You are truly a teacher of life." My health was in the lowest point in my life when I came to see you. I think it was the grace of God that guided me to you. My 4 weeks in Cottonwood changed my life around for good. Of course, all my symptoms have cleared by simply following your cleansing advice. I am eternally grateful to get my life back. In addition, you taught me how to take better care of myself. I will never forget you. Thank you sooooo much." "After weeks of suffering from diarrhea and nauseous in pain, I was exhausted physically and mentally. After doctor visits, prescriptions, emergency visit to ER, CT scan, blood tests, stool samples, no one could find "anything wrong." Then, when I was ready to give up, Fate brought me to Michi's door. And Michi helped me save my life, literally. Michi is a treasure to the Verde Valley. She is a wonderful Healer; intuitive, knowledgeable, caring and gifted. Thank you, Michi, for opening my doorway into Ayurveda. You will always have my gratitude. "When the student is ready, the teacher will come." Many blessings to you." There's hidden sweetness in the stomach's emptimess. We are lutes, no more, no less. If the soundbox is stuffed full of anything, no music. If the brain and the belly are burning clean with fasting, every moment a new song comes out of the fire. Be emptier and cry like reed instruments cry. Emptier, write secrets with the reed pen. When you're full of food and drink, Satan sits where your spirit should, an ugly metal statue in place of the Kaaba. When you fast, good habits gather like friends who want to help. Fasting is Solomon's ring. Don't give it to some illusion and lose your power, but even if you have, if you've lost all will and control, they come back when you fast, like soldiers appearing out of the ground, pennants flying above them. A table descends to your tents, Jesus's table. Except to see it, when you fast, this table spread with other food, better than the broth of cabbages. There is a light seed grain inside. You fill it with yourself, or it dies. I'm caught in this curling energy! You hair! Whoever's calm and sensible is insane! The sufi opens his hands to the universe and gives away each instant, free. Unlike someone who begs on the street for money to survive, a dervish begs to give you his life. but we saw no sign in them of the faithfulness we wanted. as water hides in metal, as fire hides in a rock. Ayurveda is a Sanskrit word which means” knowledge of life”, or “knowledge of longevity”. Ayurveda is deeply rooted in the ancient culture of India, extending back more than 5000 years. The enlightened seers of India developed this holistic method of healing the body, mind and spirit based on the Vedic texts, the world’s oldest record of spiritual knowledge. Ayurveda is much more than a medical science; it is an intuitive knowledge born out of the spiritual realm. Therefore, only with spiritual orientation can one understand this ancient science of life. Ayurveda incorporates diet, yoga, herbs, various massages, spiritual practices and correct life style to bring individuals into balance, harmony and health. Ayurveda has categorized body doshas into three basic types; Air, Fire and Water. In Sanskrit these are Vata, Pitta and Kapha, at times translated as “wind, bile and phlegm” or “catabolic, metabolic and anabolic principles”. Disease is disharmony of Vata, Pitta and Kapha, each of which influences the physical, mental and emotional aspects of the individual. Based upon Ayurvedic Principles, disharmony or imbalances are created by improper diet, lifestyle and influences, which create toxins in our body, mind and spirit. We all possess the power to create disease and the power to create good health, balance and harmony. The responsibility of the Ayurvedic Practitioner is to impart this self-healing knowledge and facilitate the tools to clients. 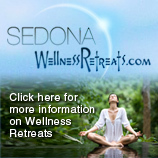 The client must participate in the healing and take responsibility for one’s own health. 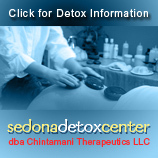 Ayurveda offers countless detoxifying and rejuvenating treatments to promote good health and longevity. We are pleased to offer many of these treatments in our Cottonwood facility. Come and experience deep relaxation with holistic herbal oil Ayurvedic Therapies and get a taste of what your Panchakarma can be like! If you are participating in Ayurvedic Panchakarma, two or more of the following traditional Herbal Therapies can be done daily to prevent disease and improve your overall health (specific recommendations are based on your dosha imbalance). Even if you are just doing internal cleansing and not participating in Panchakarma, you may experience any of the following therapies as a treat. Based on your constitution, very generous amounts of warm Herbal oils are vigorously massaged into your body by one or two therapists who combine various strokes and pressure points. It is a deeply relaxing, nurturing massage. It reaches deep into the cellular level and is especially rejuvenating to nerve and muscle tissues. Abhyanga enhances your immunity and detoxification process by separating toxins from your tissues and moving them towards your GI tract. This is our most popular full body massage, and is often combined with Shirodhara. Abhyanga promotes healing and longevity by releasing tension and connecting the flow of vital energy throughout the whole body. It stimulates the circulatory system and helps to release toxins while inducing deep relaxation and balance. Abhyanga is a deep massage which promotes sweat and penetration of herbs. We make generous use of warm Ayurvedic herbal oils and apply heated basalt stones to different areas of your body. Nasal herbal oil, head and facial massage may be added to the treatment. Shirodhara is one of the most unique therapies available for reducing stress and enhancing cellular intelligence and immunity. Shirodhara means “pouring warm oil in a slow steady stream on your forehead.” It pacifies and balances the subtle aspects of all the doshas, nourishes the nervous system, promotes relaxation and tranquility, and improves mental clarity and comprehension. 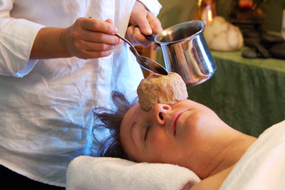 It has very profound effects on the consciousness and has often been called third eye or bliss therapy. Shirodhara is our signature treatment. A series of this therapy can help improve certain neurological and mental imbalances. Before pouring warm oil on your third eye (or forehead), the therapist will massage your feet, belly, and head with warm oil to relax your body and mind. 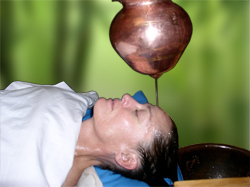 Shirodhara is mostly followed by Abhyanga and Steam Therapy during Panchakarma. This therapy is usually offered on the massage table followed by Ahbyanga. Here, steam is applied evenly to the entire body (except the head) with the use of a steam tent. Based on your condition, Swedhana is used to enhance detoxification by allowing herbal oils to further penetrate into all your tissues. Aromatherapy oils are added for additional healing. During the session, your therapist will provide a cool towel and rose water spray. This is a very good therapy for anyone who has had surgery in the belly area. This treatment helps to balance the navel chakra, strengthens digestion and absorption, and assists decrystalization and release of deeply seated emotions. If it is done repeatedly, it is an effective treatment for IBS, flatulence, constipation and abdominal discomfort . Navel Chakra Basti is done by creating a wheat flour dough pool over your navel area and filling it with warm herbal oil. A session lasts about 45 minutes. Throughout that time, your therapist will keep the oil warm while occasionally massaging your feet and head to enhance relaxation. This is one of the most nourishing and rejuvenating therapies for the eyes. Netra Basti is done by placing a wheat flour dough (like a doughnut) around the eyes, then filling it with clarified butter. By clearing excess toxins, this therapy helps relieve eye stress, improve vision and pacify the doshas in the head area. It is used to prevent and treat a wide variety of eye symptoms, including poor vision, floaters, eye fatigue, macular degeneration, glaucoma and cataracts. This is a most popular herbal oil treatment for relieving stiffness and nourishing your lower back. The lower back is one of the primary sites of vata. A flour dough dam is made, filled with the appropriate herbal oil and placed on your lower back. By soaking the area in heated oil for about 45 minutes, pain, soreness and tension are relieved. By placing several doughs, this treatment can also be applied to your whole spine. This treatment is performed over your heart to decrystalize deep seated emotions, clear toxins and nourish, strengthen, and regulate heart functions. Hurud Basti also uses flour dough placed over your heart area, filled with the appropriate oil. © Copyright 2011 Michi Nadler. All Rights Reserved. Web design by Dan Turner.